The School Loop system maintains statistics about your sites. These statistics include sitewide page view, posts, and registered users as well as post per teacher. 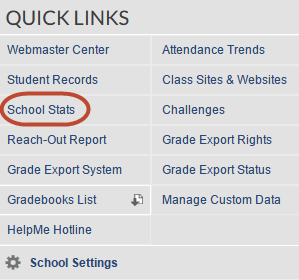 The link for School Stats can be found in the Quick Links of sysadmins, principals, assistant principals, staff and teachers. The number of new posts for teachers includes assignments, notes, news, events, LoopMail messages, and discussion replies. Posts such as assignments count as 1 regardless of how many periods receive that assignment. LoopMail messages count as 1 regardless of the number of recipients. The number of students for each teacher counts the number of unique students for that teacher. If a student is in more than one class for the teacher, they are only counted once. The statistics change on a daily basis to create a running 30 day total. Stats can be used for various reasons, such as calculating the percentage of teachers posting items. Take the total number of teachers posting items and divide it by the total number of teachers, and you have a teacher participation stat. Another calculation from the School Stats page is the percentage of family participation. The number of households is the number of students who have at least one registered parent. Take the total number of households divided by a total number of students and this creates a percentage of families using School Loop. Webmasters can also see a 30-day running total of page views of every page on the public website. From the webmaster center, click Manage and select Site Stats. You can also use Google Analytics with School Loop. 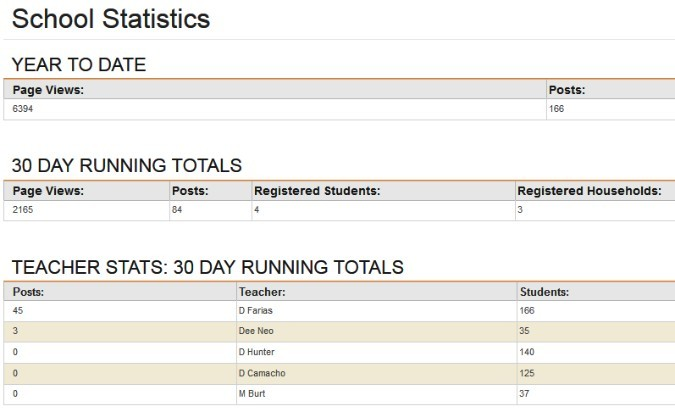 Note: District Admins can generate usage stats for all schools or for all teachers. See the District Statistics.